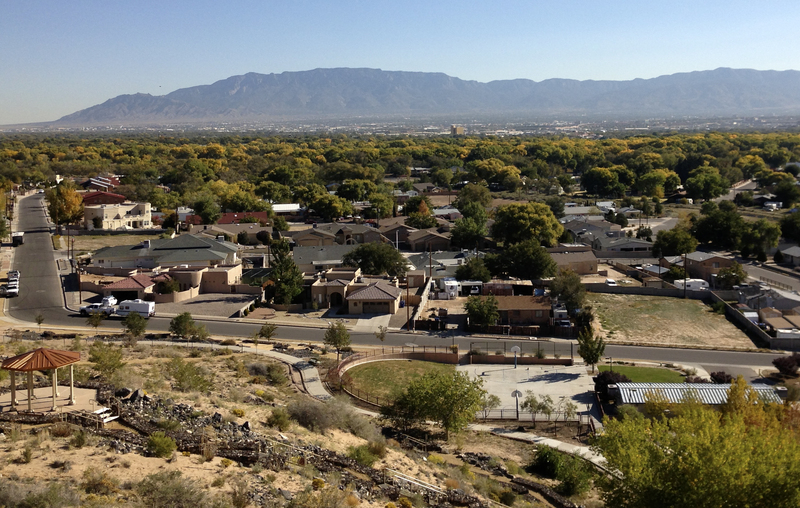 Our favorite view of Albuquerque, from our neighborhood park, Pat Hurley Park. The countdown is almost over! In two days we will be pulling out of Albuquerque in our vintage Travelmate motor home and embarking on our latest adventure! The past month has gone by so slowly, yet here we are, about to leave. We had a huge list of things we had to take care of before we could leave for a long absence. There were home repairs and improvements that had to be done so we could rent our house. We had to move all of our belongings that didn’t fit in the RV into storage. There was painting to be done at Chroma Studios. We had chickens to find a new home for. Our two male dogs had to be neutered! Plus, a bunch of other things here and there that popped up. We do, in fact, still own a business here in Albuquerque. Chroma Studios is still here and going strong. Luckily, for us, it doesn’t take a lot of time to run and our youngest son is looking for experience with managing a business. He is currently enrolled at our local community college, majoring in business. What better way to learn about business than to manage one? He will take care of day to day operations, though we will still oversee everything from afar. 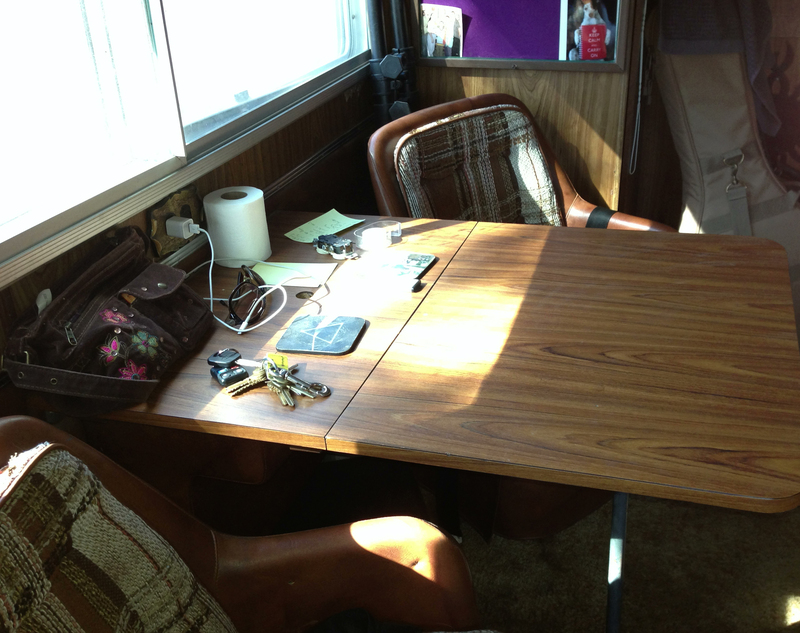 My new space for painting, yes, it’s the table in our RV! Because we have spent the last month working on preparations for our adventure, we have had to put our music and art businesses on the back burner for the most part. I am so excited to get back to being creative again! It is the one thing that keeps me sane! Let’s just say this past month has been pretty crazy! We did get a few opportunities here and there to be creative, but now, we will be spending ALL our time on our creative endeavors. I have a new art project to get moving on, we have new songs to write and learn, and of course, I will be blogging regularly about our latest adventures in travel! Our first stop is a personal one, we will head south on I-25 to Las Cruces, New Mexico to visit with my brother and his wife for about a week before we go west to Arizona. There may also be a stopover in the Gila National Forest for a bit of decompression time, ie peace and quiet away from everything! I’m not sure if I have talked about our big upcoming adventure here on the blog before. I guess now is a good time for it, seeing as we are only about 2 weeks from heading out! If you have read my story, you know that I was a very young mom. I started having my sons at the age of 16. Being thrust into motherhood at such a young age had it’s pitfalls, but I prefer to look on the bright side of things. Though life was tough when I was in my late teens and twenties, the good side of that equation is the fact that now my sons are grown and I am still in my early forties! My husband and I have been dreaming and planning for the eventual empty nest for years. Now that it’s here, we are ready and raring to go! Our youngest son actually graduated from high school just over 2 years ago. We decided to give him a couple of years before we left town. Here we are now, a motor home sitting in our driveway, all of our belongings packed into storage or the RV, the house is almost completely ready for our tenants and we will be hitting the road in just under 2 weeks if all goes as planned. We still have quite a to do list to accomplish before we can go, but we are getting there! Many people have misconceptions about exactly what we are up to, so I figured I would get into a bit more detail here on the blog. Traveling is something we have always wanted to do. We are NOT vacationing or even semi-retired though. We are going to be working while we travel. One of the things we couldn’t do when the kids were younger and still in school, was to tour the country with Aaron’s music. My husband, Aaron Lewis, has been a musician for 25 years. He put his career somewhat on hold all these years. Any musician will tell you that the only way to get your name out there and build a fan base is to tour, regularly. We have made a few trips here and there, but now we are putting our whole hearts into it! Now that Aaron and I are also performing as a duo, we have even more reason to tour. Another thing we plan to spread around the country is my art work. When I first started out as an artist, over 20 years ago, we would travel around and sell my prints at various shops, galleries, etc. This was before the internet made selling art a bit easier. Even with the internet however, it’s still better to get out in person, visit the galleries I would like to place my art with and connect in person, face to face. The most important aspect of this adventure is getting out in the world, meeting with fans and friends face to face! We look forward to meeting lots of wonderful people out there on the road, making new lasting friendships and memories we will cherish for the rest of our lives. We are taking our music and art with us and will continue to create new art and music as we go. Stay tuned for updates; blog posts, videos and pictures of our travels.